We attend all kinds of great events all across the northeast. Tap takeovers, beer dinners, tastings, lectures, beer festivals—if there’s beer we’re there. We’ve provided this list of events so that it’s easy for everyone to find us and come have a drink. Take a look, and come join us! You’re invited! Our second annual Beer Dinner featuring Jack’s Abby Craft Lagers will take place on Tuesday, April 9, 2019. Join us starting at 6pm for five incredible courses paired perfectly with five craft lagers we’re sure you’ll love. Tickets are $60 per person (tax and gratuity included). Make your reservation soon before spots run out! Half Price Axe Throwing Hosted by Jack's Abby Craft Lagers! $100 Gift Card for the Highest Score Prizes | Beers | Games Don't forget to tag us with your experience! Half Price Axe Throwing Hosted by Jack’s Abby Craft Lagers! In a world that seems to remain divided, Kate Soper’s “Ipsa Dixit” – a finalist for the 2017 Pulitzer Prize – explores the ways that we communicate. Language is complex and words are more than what they mean on the surface. Experience this semi-staged interactive opera that will leave you surprised, engaged, and hopefully more aware of the power of words. Hosted by Original Gravity Concert Series, this performance by Equilibrium is in collaboration with seven local brewers who will pair beers to be served throughout the piece. Specially selected beers by Allagash Brewing Company, True North Ale Company, Exhibit ‘A’ Brewing Company, Jack’s Abby Craft Lagers, Redemption Rock Brewing, Cambridge Brewing Company, and Bone Up Brewing Company help tell the story alongside the music creating an interactive, multi-sensory event like no other. EARLY BIRD TICKETS AVAILABLE: SAVE $5!! Bike MS Rookie Rider Kickoff Party Jack's Abby Beer Hall & Kitchen 100 Clinton St.
15apr8:22 pm8:22 pmBike MS Rookie Rider Kickoff Party8:22 pm - 8:22 pm 100 Clinton St.
Jack’s Abby will be hosting a Rookie Rider party for all of those participating for the first time in Bike MS: Capecod Getaway 2019! Join us on Tuesday 4/23/2019 at 6:30pm for an amazing evening of beer and food pairings! Founded in 2011 by three brothers, Jack, Eric, and Sam Hendler, Jacks Abby has become a mainstay of the craft brewing scene in the Northeast and nationwide. The Hendler brothers grew up in a family that promoted entrepreneurship and hard work. Spending summers with their grandfather and working at the family’s ice distribution company, they learned the value of committed family members and loyal employees the foundation of which Jacks Abby is based. We’re sure they’ll have more to share with you about their operation on April 23rd! Pink Boots Brew Release Party! Jack's Abby Beer Hall & Kitchen 100 Clinton St.
25apr5:00 pm7:00 pmPink Boots Brew Release Party!5:00 pm - 7:00 pm 100 Clinton St.
Join us at the Jack’s Abby Fest Hall to celebrate the release of our Pink Boots Brew! The Pink Boots Society was created to assist, inspire and encourage women beer industry professionals to advance their careers through education. Celebrate with us and enjoy a pint of our Pink IPL, brewed by the women of Jack’s Abby Brewing. Food trucks, beer & wine garden, craft fair, free live music and dance performances, demo/hands-on tent with free crafts for kids, and a fine art exhibition, all at the Town Common and Hayward Manor! Proceeds benefit the Random Smile Project charity and the Franklin Cultural Council grant fund. Join us for a special Saturday evening hike guided by lunar light, followed by a Jack’s Abby beer tasting. This family-friendly event will be led by a Trustees ranger and naturalist. The hike will be 30-45 minutes long, depending on the group’s ability, and will follow some of Chestnut Hill Farm’s most beautiful trails. Popular craft brewery Jack’s Abby will provide flights of beer for sampling after the hike and will describe the various flavor profiles. There will be light snacks, and hot cocoa will be provided for children — plus s’mores by a bonfire, too (weather permitting)! Be sure to wear boots or shoes that are appropriate for hiking in potentially wet and muddy spots, and you may want to bring a flashlight in case of cloud cover. Space is limited for this event. Pre-registration is required. Please note that while we love doggos, they are not permitted at Chestnut Hill Farm. Join us for a patio party at Deep Ellum to tap our Maibock Hurts Like Helles kellerbier gravity keg! Join the Jack's Abby team for a great night. Chef will be pairing his creative dishes with our lagers. Tickets are available at the restaurant. $65 per person. Join the Jack’s Abby team for a great night. Chef will be pairing his creative dishes with our lagers. Tickets are available at the restaurant. $65 per person. Our Monday night Trivia this week is sponsored by Jacks Abby! The premiere lager makers on the East Coast, we’ll have several options on tap as well s swag giveaways. About the brewery: “Founded in 2011 by three brothers, Jack, Eric, and Sam Hendler, Jack’s Abby has become a mainstay of the craft brewing scene in the Northeast and nationwide. Clock out and post up for trivia night with a pint of Jack’s Abby’s Post Shift Pilsner. 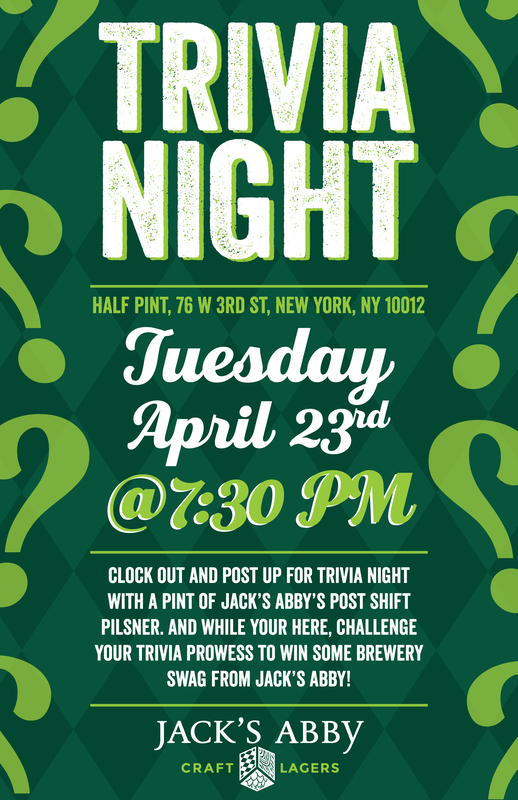 And while your here, challenge your trivia prowess to have a chance to win some brewery swag from Jack’s Abby! We'll be sampling some of Jack’s Abby’s iconic lagers! House Lager, Blood Orange Wheat, and Citra Brau. We’ll be sampling some of Jack’s Abby’s iconic lagers! House Lager, Blood Orange Wheat, and Citra Brau. Join us at Generals for Jack's Abby Pint Night! Join us at Generals for Jack’s Abby Pint Night! Our Facebook page also has a full list of events. RSVP and invite your friends! Follow our main brand @JacksAbby, and if you're in the area, follow @JABeerHall for limited lager releases, menu specials, and fun events!